By the time Cisco arrived at the microphone, he had been greatly sanitized to make him acceptable kiddie fare and had picked up the obligatory humorous ethnic sidekick -- Pancho, lifted without acknowledgement from Miguel Cervantes' 'Sancho Panza' character in 'DonQuixote'. 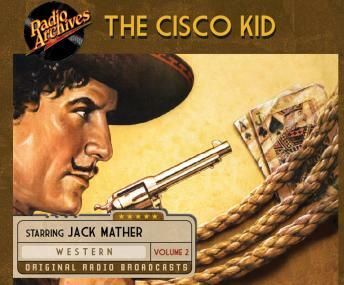 Thus modified, 'The Cisco Kid' became a favorite with western and adventure fans during the 1940s. Dubbed 'The Robin Hood of the Old West', his radio adventures originated for many years at WOR, New York, and were widely syndicated by transcription by the Frederic W. Ziv Company of Cincinnati, Ohio. Jack Mather and Harry Lang filled the lead roles, supported by the usual WOR stock company, and the transcribed series was produced for nine highly successful and lucrative years. This is the first volume in its series.